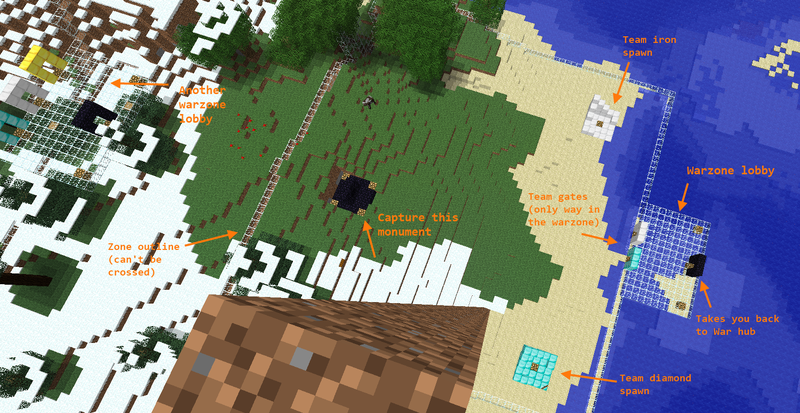 This large picture defines the main parts of a warzone (for CTF, see the video to the right). Here are the commands you have access to as a regular player on a War server. Essential commands are in bold. Teleports you to the warhub, if it exists. The warhub offers portals to reach each warzone on the server. Lists the warzones on the server. Each warzone is an independent TDM arena. Teleports you to the specified warzone's lobby. Lists the teams in the warzone. Must be standing in zone or in its lobby. In zone, use to change teams. In lobby, use to join team as alternative to walking in the team gate. Use "/war join" to work around conflict with HeroChat. Use to leave a warzone. Teleports you back to the zone lobby. Must be in a team already. Use "/war leave" to work around conflict with HeroChat. Zone makers are those who create the warzones regular players can enjoy. Ask a op to add you. Using any Permissions plugin. Add the two following nodes: 'war.zonemaker' and 'war.player'. Old system that still works if Permissions is absent: add your name to the "zonemakers" list of the war.yml settings file. Ask an exiting zone maker to use the /zonemaker <your-name> command. Use /zonemaker <name> again to kick. When you create a new warzone, you are assigned as its author. As a zone maker you can only edit your own warzones. Essential commands and settings are in bold. Those in <brackets> are mandatory. Here are the zone maker commands. Type "/setzone ziggy" (or "/setzone ziggy wand"). You'll receive a wooden sword. Left-click to place the first corner. Right-click to place the second cuboid corner. Drop the sword to deactivate warzone setting and resizing. At one extremity, type "/setzone ziggy corner1" (or c1 or pos1 instead of "corner1"). At the other end, type "/setzone ziggy corner2" (or c2/pos2). Make sure to remember what corner is where! The old "/setzone ziggy <nw/se>" mode is still supported. By default, the Northwest corner becomes corner1 (with corner1 at the top block, y=127). i.e, to bring down the roof of a classic warzone, go to the Northwest corner at the desired height and type "/setzone ziggy c1". By default, the Southeast corner becomes corner2 (with corner2 at the bottom block, y=0). i.e, to bring up the floor of a classic warzone, go to the Southeast corner at the desired height and type "/setzone ziggy c2". Using nw/se to resize a cuboid warzone will not change the height of its corners. Use to persist any aesthetic or practical changes made to the zone after the last save. Must be in warzone or lobby. Use optional named parameters to change zone config like with /zonecfg. See /zonecfg name parameters. If you just want to change the configuration of the warzone and not save the blocks, use "/zonecfg" instead. Provide zone name if not standing inside zone or lobby. Reloads zone blocks from disk (as they were last saved by /setzone or /savezone). Sends everyone back to the warzone lobby. Lobbies are stuck by default at mid-height on the south side of a warzone. To change which wall the lobby is attached to, from inside the warzone or the lobby, type "/setzonelobby <north/east/south/west>". The lobby can also be detached from the warzone wall. When standing outside the warzone or lobby, use "/setzonelobby <warzone-name>" to move that warzone's lobby to your location. Creates or moves a team spawn. The lobby is updated to reflect any new team. The only available teams are diamond, iron and gold. Must be warzone. Available team colors are: diamond, iron, gold, white, orange, magenta, blue, green, pink, gray, purple, navy, brown, darkgreen, red and black. Creates or moves a monument. Must be in warzone. Adds or moves the team's flag post. Other teams can break the flag block and try to reach their own spawn or flag to score a point. Creates or moves a bomb. Must be in warzone. Creates or moves a cake. Must be in warzone. Warzone settings can be inherited from the War/global level, but they can be tweaked on a per-warzone basis. Use named parameters in any order to change configuration of the zone. This command does not save zone blocks like /savezone. Some changes may not be applied until you use /resetzone or the warzone resets automatically. autoassign:<on/off>. Replaces the lobby team gates with a single door that automatically choose a team for the players. Off by default. bockheads:<on/off>. Gives all team members a head made of the wool color of their team. On by default. deathmessages:<on/off>. Toggles the War kill/death feed. disabled:<on/off>. Hides the warzone at the warhub. Prevents new players from joining the zone. Reset the zone with /resetzone to kick out players. Use to let normal player let you, the zonemaker, work in peace and to prevent accidental warzone resets while you're working. friendlyfire:<on/off>. Let team mates hurt each other. glasswalls:off. Turns off the magic glass walls. Players are bumped back into the zone if they stray outside. instabreak:true. Makes blocks break instantly inside warzones. Useful for spleef. minteams:1. Use in combination with minplayers. If you don't have minplayers players on at least minteams teams, then the players can't leave the spawn. minplayers:1. Use in combination with minteams. monumentheal:<number>. The number of hearts restored when healed randomly by a monument. nocreatures:<on/off>. Prevents mobs and animals from spawning inside the warzone. Off by default. nodrops:<on/off>. Turn on to prevent people from dropping inventory items on the ground manually (to prevent item exploiting). Off by default. pvpinzone:<on/off>. Turns off in-zone PVP. Useful for spleef. On by default. realdeaths:<on/off>. War intercepts and prevents real deaths for fast respawn. Turn on for better plugin cross-compatibility. Off by default. resetonempty:<on/off>. Whether the zone should reset automatically when the last player leaves (to give a clean playing field for the next players). resetonload:<on/off>. Whether the zone should reset automatically when the plugin loads. resetonunload:<on/off>. Whether the zone should reset automatically when the plugin unloads. unbreakable:<on/off>. Prevents the blocks in the warzone from being edited during a match. Off by default. You can also set warzone-level default for team settings. For example, teams will have 3 lives by default if you use "/zonecfg lifepool:3". Refer to /teamcfg below. Fill your inventory with the desired items and type "/savezone loadout:default" to change what item kit players receive when they respawn. To add an extra loadout (i.e. more classes). Type "/savezone loadout:<extra-loadout-name>". Players that are still standing in the spawn can toggle between loadouts by sneaking. Remove extra loadouts with "/zonecfg deleteloadout:<name>". Fill your inventory with the desired items and type "/savezone reward:default" to change what the winning team players get when they win a game (when the maxscore is reached). /zonecfg lobbymaterial:<floor/outline/gate/light>. While holding block, change the look of the lobby (use air block to keep original floor). If you are holding nothing (i.e. air) and you use this command with the "floor" or the "outline" parameter, it tells War to use the original floor instead of overwriting it. Pro-tip (works with warhub as well): The brand new (slightly backwards) way to build a pretty warhub or warzone lobby is here! First, build a nice area with a nice floor, colums or other details. THEN, use /setwarhub or /setzonelobby to place your structure. Switch out the materials with "/warcfg warhubmaterial:<floor/outline/gate/light>" or "/zonecfg lobbymaterial:<floor/outline/gate/light>". Hold nothing while using the warhubmaterial:<floor/outline> or lobbymaterial:<floor/outline> command in order to keep your original floor. Voilà! You have a pretty warhub or lobby! If your lobby or warhub is already placed, I suggest moving it away, making a nice build, then placing it back in its original position once you are done. Akward, but it works! /zonecfg material:<main/stand/light>. While holding block, change the look of the monument, flag, cake and bomb. To add an author to a warzone, use "/savezone author:<newname>". To remove an author, use "/savezone deleteauthor:<name>". You can print the current configuration with "/zonecfg print" or "/zonecfg -p". To restore inheritance to the War-level defaults, use "/warcfg delete:blockheads". Use "/setzoneconfig" as an alias. Team default configurations can be inherited from the War/global level or from the warzone-level. You can also tweak settings on a per-team basis. flagmustbehome:true. Whether you can bring home a flag if your own flag is currently stolen. flagpointsonly:false. Use for pure CTF scoring. flagreturn:<both/spawn/flag>. Determines where flag carriers can return their flag to score a point. lifepool:<number>. Determines how many lives each team has before the zone blocks reset and a point goes to their adversaries. nohunger:true. Turns off hunger and food auto-regeneration. playerloadoutasdefault:true. A copy of the player inventory as he entered the warzone is used as the default loadout. respawntimer:<seconds>. Time before you can leave spawn after respawn. saturation:<0-20>. Controls how fast the player becomes hunger. 0 saturation means the player becomes hungry straight away. spawnstyle:<big/small/flat>. Changes the look of the team spawns. Default is big. teamsize:<number>. The size of each team. Loadouts can be team-specific. For example, "/teamcfg red loadout:default" will give a different default loadout to team red compared to other teams. Print out the team config with "/teamcfg <team-name> print" or "/teamcfg <team-name> -p". To restore inheritance to the War or warzone level, use "/teamcfg red delete:teamsize". Zone blocks are restored (from disk). Teams are respawned. Just as if a team's life pool had been exhausted. Deletes the zone, resets all blocks. Deletes the team. Team must exist. Toggles between player mode and zone maker mode. Or gives/removes access to zonemaker commands for another player. Use "/zm" as an alias. The following commands are restricted to War admins, who must have the 'war.admin' permission node or be Op. Create or moves a West-facing wall of portals. One portal per warzone. Warzones get a portal back to the warhub. Deletes warhub and resets zone lobbies. buildinzonesonly:false. Set to true to limit building to inside warzones only. Give the 'war.build' permission to let people build outside warzone when this is true. disablebuildmessage:false. When buildinzonesonly:true, a warning appears to explain to users why they can't build. disablepvpmessage:false. When pvpnzonesonly:true, a warning appears to explain to users why they can't pvp. pvpinzonesonly:false. Restrict PVP to warzones only. Give the 'war.pvp' permission to those you want to let pvp outside. tntinzonesonly:false. Restrict TNT explosions to inside warzones. maxzones:12. Limit the number of warzones zonemakers can create. Changes the global, default warzone and War-level default team configuration values. Refer to /zonecfg and /teamcfg. About global settings: note that pvp, tnt and building can be restricted to warzones-only with pvpinzonesonly, tntinzonesonly and buildinzonesonly. The maximum number of warzone can also be controlled with maxzones. /warcfg warhubmaterial:<floor/outline/gate/light> -> while holding block, change the look of the warhub (use air block to keep original floor). See Pro-tip in /zonecfg above. To change where a player get teleported to at the end of a match (i.e. when the maxscore is reached), type "/setwarconfig rallypoint:<warzone-name>". This is useful for chaining warzones together, forcing people to warp to the next map in line when a game ends. For example stand in warzone ziggy's lobby while typing "/warcfg rallypoint:dusty" to make sure players go to warzone ziggy after a game in dusty. Use "/setwarconfig" as an alias. You can print the current configuration with "/warcfg print" or "/warcfg -p". Any command conflict can be worked around by prepending "war " to the command. For example, "/war setzone X" will work, as will "/war deleteteam <team-color>". All commands that optionally take the zone name (e.g. with the [zone-name] parameter) can be used from the server console. By default, War blocks all non-War commands inside warzones. To let some commands through this blanket ban, edit the war.yml configuration file, add commands to the list commandwhitelist then reload your server. Download the latest version of War and a compatible bukkit build. Make sure the file is named "War.jar" and put it in your craftbukkit/plugins folder. Set your server pvp and online settings to true. The first time you run your server, the war.yml settings file will be created. Add yourself to the list of zonemakers and restart your server. Here's how I set up my GroupManager groups.yml, to get your started on the right track: download. War is also compatible with SuperPerms/PermissionsBukkit. The only difference is that the 'war.player' and 'war.warp' permissions come by default. Don't get too attached to your config and data files. Their formats will certainly change down the road. Remember to make regular backup of your worlds when using War. Thanks for helping me make this plugin all it can be by using this button. This was shot for War v0.2.